So I am back at work and very definitely feeling better than I did. 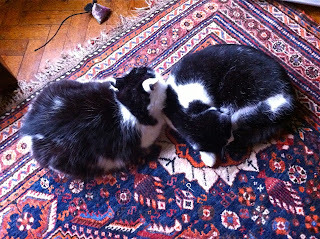 However, updating my blog is having to be done one-handed, as there is a very cute black an white cat curled up on my lap, holding my hand in his paws the way a child holds a teddy bear. Have you ever watched a cat dreaming? Rio's whiskers and nose are twitching, his tail is flicking and he keeps making little growling sounds. Far too cute to move him for something as mundane as typing with two hands! Anyway, last time I blogged (two weeks ago - I must have been ill to miss a Sunday blog update! ), I posted photos of birthday cakes. 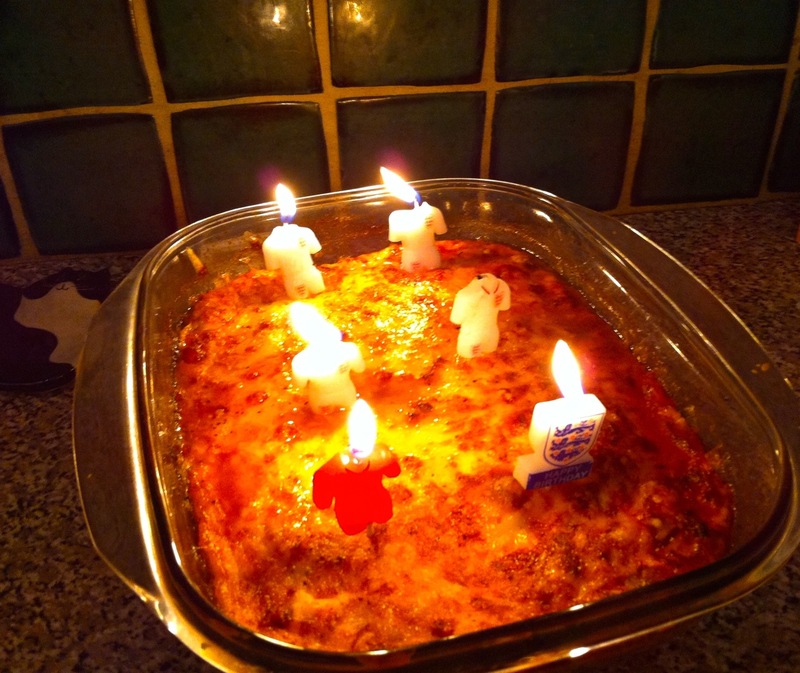 It was also Mark's birthday, but he doesn't have sweet tooth - so he had a birthday moussaka with footballer candles instead! Probably the worst thing about having been ill is not having been able to do any singing - no lessons and no choir. To make matters worse, I missed a couple of choir rehearsals because of holiday too and suspect I have now missed too many rehearsals to take part in the Christmas concert. It is such a lovely programme, I really hope I can persuade them to let me sing. 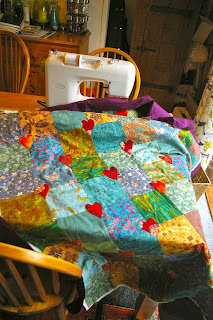 I have, however, been working on a quilt for the choir's fund-raising dinner and auction. I am actually working on two, as the first one is a bit homely (although I love it), so I have also started a more understated one. At this point I have to send a huge thank you to lovely Leanne at work. 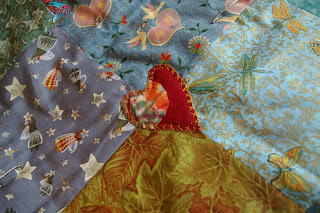 I have always thought of quilts in terms of colour and texture and image, with stitches way down my list of priorities, but Leanne has opened my eyes to the joy of stitches. 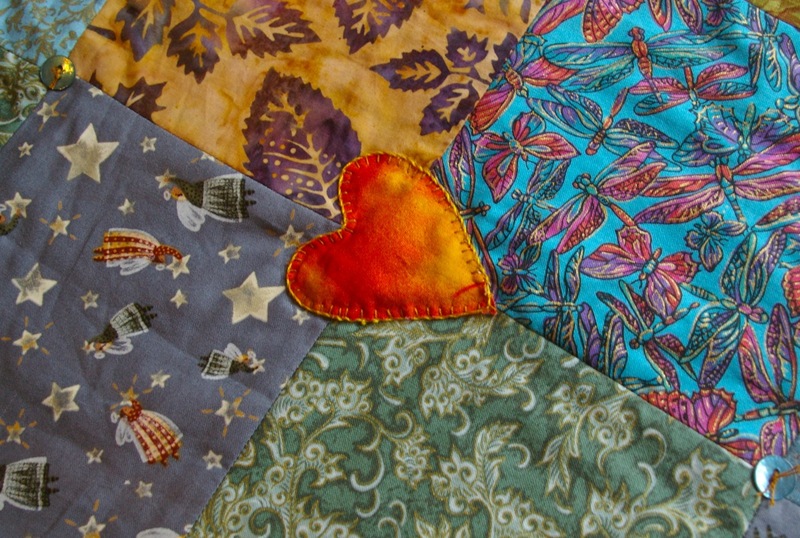 I am too messy to be an embroiderer, but there are the most gorgeous quilting/patchwork/appliqué stitches, with which I am now totally infatuated. I treated myself to the "Handbook of quilting and patchwork stitches" by Nikki Tinkler, and I am gradually working my way through the book as I appliqué flame-coloured hearts on the blue/green/gold homely quilt. 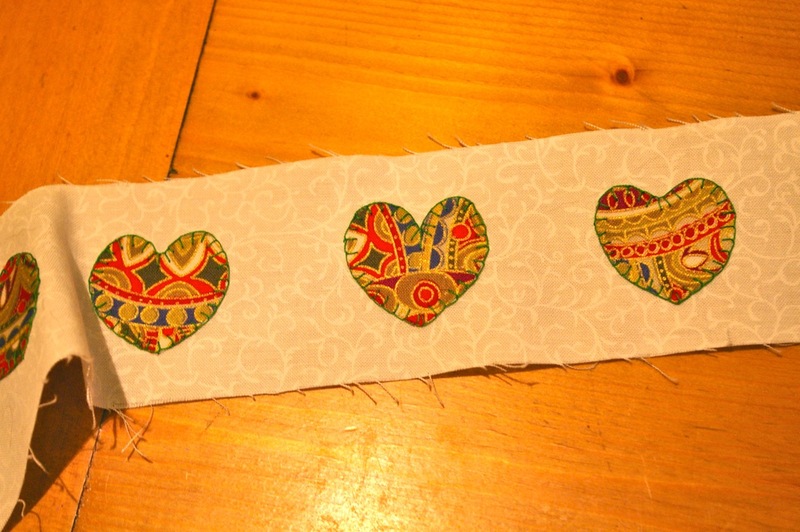 The first few hearts use quite basic stitches, but I aim to increase the complexity as I go along. The quilt I am donating to the choir's auction is made of strips of creams and greens, with a single row of hearts. 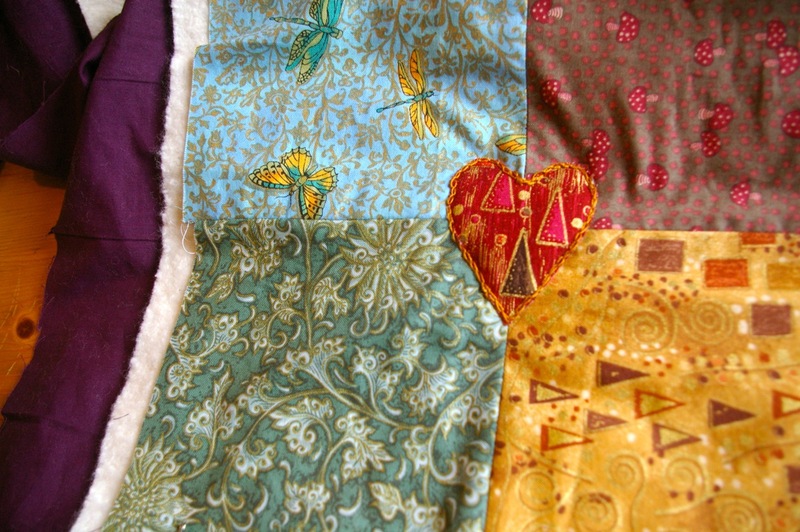 And finally...I have to share a recent purchase. I saw these cat face buttons online (www.beadandbuttoncompany.co.uk) and just had to have them! 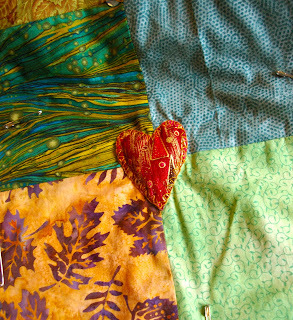 And I love your quilt - the colours, the hearts and... well, everything about it! Thank you, Irene. I am glad too...! I looked and they do! 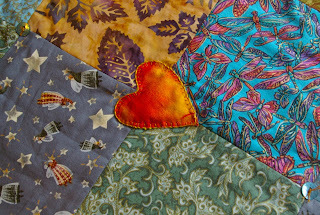 (sort of) and they are on their way to me...and from me to you! And as I was on the site, a set of christmas lights buttons ended up in my basket too, and I can't wait to use them on something. Your quilt is beautiful and also the handstiching! It is very fun, I am not at all surprised that you like it. Happy to hear you are feeling better, and I do hope they will let you be a part of the Christmas choir! 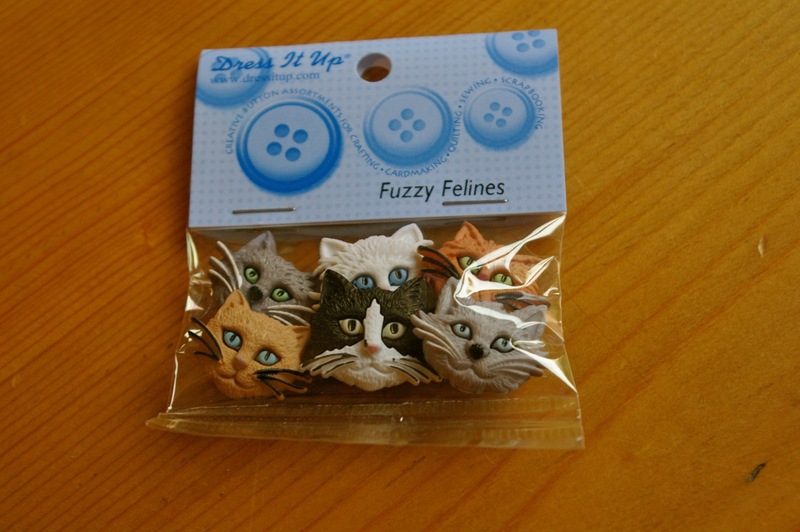 Your buttons are soooo cute! Thank you Annika - from you that is a compliment indeed! I heard from the choir's secretary and she thought that, as long as I felt happy to take part in the concert, that would be ok!! Yay! I just couldn't bear the thought of them singing Whitacre's Lux Aurumque without me.